Do your students have difficulty answering simple Where questions? This product is perfect for a handy reference to show students how to answer. Just laminate this one page PDF and point to important areas of the guide when teaching or correcting. I have used this guide for nonverbal students on the Autism Spectrum who use AAC programs to respond correctly to simple Where questions. 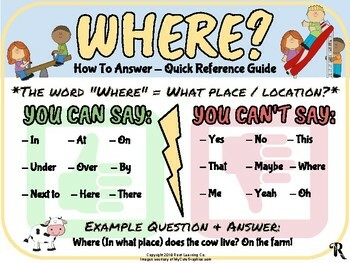 I hope this resource helps you with literate kids who need clear visuals!